Mars Objects: Signs of Life? Our excellent online 70-648 Certification dumps and 70-573 exam Certification will lead you to success in the testking 70-523 certifications. We also offer latest exam oracle 70-519 guide and HP0-J48 Certification training dumps with 100% success guarantee. Is this an artificial construct on Mars? An Examination of MGS imaging data for MOC Image m1501228b. In this effort we will attempt to assess the validity of imaging data relating to the purported entrance to the "Martian Glass Tunnel System" which was posted on Johnny Danger's Dangerous Mars Site. As other credible researchers have speculated profusely on the nature of these "tunnel like\tubular anomalies" we will not re-iterate their notions or add to the confusion with additional conjecture (however, some degree of speculation is inevitable due to the subject matter). Our intent is to examine the MGS ancillary data related to the imaging of this area on Mars as well as utilize several image analysis techniques in an attempt to discern the true nature of this unusual image and several geographically adjacent anomalies found in the vicinity. I heartily recommend downloading these images and viewing them with a decent viewer or imaging program such as Photoshop, as utilizing a web browser for their perusal is inadequate. I would also recommend viewing them on a high resolution monitor (CRT) rather than a laptop. The original source for the image under analysis is MOC m1501228b . I will further preface this analysis with this disclaimer. 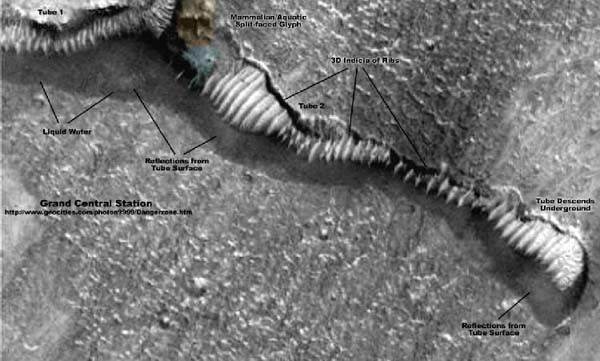 I am a layperson who has, as a hobby, taken an interest in Martian anomalies. It has been very educational as well as entertaining. I am not a professional scientist, educator or imaging expert. I will not benefit from any financial gain as a result of the dissemination of this information. That being said, I've done my best to utilize the God given natural ability and talent I've been blessed with to understand and analyze this data in a thorough and impartial manner (with an enormous amount of help from others for which I cannot adequately express my appreciation). Any errors or omissions are the results of this authors unfamiliarity with this "rocket science" and are not a deliberate attempt at duplicity. I merely seek the truth and a better understanding of the universe we exist in. 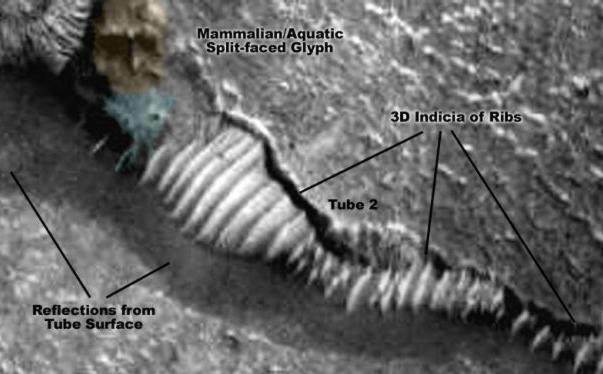 David C. Pieri, Ph.D. Earth and Space Sciences Division of the Jet Propulsion Laboratory has postulated that the "Martian Glass Tunnel Anomalies" are nothing more than simple Martian dune trains. I am not acquainted with Dr. Pieri and have no intention of impugning his reputation. He is after all a respected planetary scientist with years of experience in the field, and I am merely an individual with an interest in these subjects. Dr. Pieri makes an excellent point that the interpretation of satellite imagery can be ambiguous, especially for those individuals untrained in remote sensing applications. I do, however, feel that Dr. Pieri's judgment of these anomalies, based on only one image, posted on the Enterprise Mission web site, may have been premature. Additional data in the form of images from the Mars Global Surveyor has been located and would seem to support the hypothesis that these unusual features are something far more interesting and enigmatic than a mere sand dune. 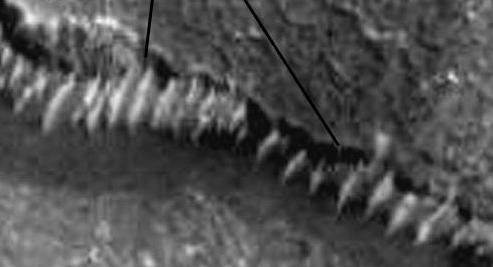 Readers may wish to read our earlier analysis of MOC image m1501228d which addresses the apparent dichotomy between "Martian Dune Trains" and "Martian Glass Tunnel Anomalies". First let's revisit an image from our last installment. 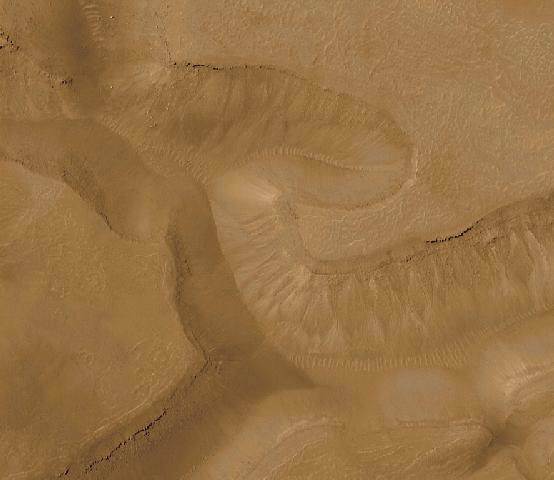 Shown here is an actual Martian dune train image from the Malin Space Science Systems image repository. A link to the original image is provided below. In this composite image we have taken the portion of MOC image m1501228a that is immediately adjacent to MOC image m1501228b and created a single image in hopes that it will help further our analysis and as well as to simply see the "big picture". (Mr. Danger undoubtedly thought that the flat spot on the top of the humanoid head was an area for the convenient storage of a six pack of his favorite beverage! Not so, Mr. Danger! :) Just above "Grand Central" in MOC Image m1501228a one can spot an additional incongruity in the appearance of an unusual object that we will visit further along in this piece. Mr. Danger's "Grand Central Station of Mars" image can be seen immediately below. Rather than hyper link to or append these parameter definitions I have chosen to post these here to illustrate the daunting task faced by the layperson when attempting to foray into the bailiwick of "rocket scientists". Thanks to all those folks whose infinite patience with my seemingly endless questions enabled this analysis to be realized. Emission Angle - emission angle at center of image. The emission angle provides the value of the angle between the surface normal vector at the intercept point and a vector from the intercept point to the spacecraft. The emission angle varies from 0 degrees when the spacecraft is viewing the sub spacecraft point (nadir viewing) to 90 degrees when the intercept is tangent to the surface of the target body. Thus, higher values of emission angle indicate more oblique viewing of the target. Gain - gain mode is the operating mode of the camera that defines the sensitivity of the instrument. Image Description - Mission-generated text description of the nominal intent of the observation. Incidence Angle - incidence angle at center of image. The incidence angle provides a measure of the lighting condition at the intercept point. Incidence angle is the angle between the local vertical a the intercept point (surface) and a vector from the intercept point to the sun. The incidence angle varies from 0 degrees when the intercept point coincides with the sub solar point to 90 degrees when the intercept point is at the terminator (i.e., in the shadowed or dark portion of the target body). Thus, higher values of incidence angles indicate the existence of a greater number of surface shadows. North Azimuth - The angle in degrees clockwise from the reference axis of the image (a line from the center to the right edge of the image) to the direction to the north pole of the target body. If the ORIENTATION parameter is 'MIRRORED', the image should be flipped prior to applying this angle." Offset - offset mode is the operating mode of the camera which specifies the additive component of the signal. Orientation - Because of the MOC's line-scan nature, depending on the orientation and sense of rotation of the spacecraft and the optical inversion properties of the camera system involved, MOC images can either be normal or flipped left-to-right (independent of whether the image is north up or south up.) This flag will be 'MIRRORED' if the image should be flipped left-to-right, and 'TRUE' if it is already in normal form. For those images having a value of 'MIRRORED', the JPEG images have been flipped left to right." Phase Angle - phase angle at center of image. The phase angle provides a measure of the relationship between the instrument viewing position and incident illumination (such as solar light). Phase angle is measured at the target. It is the angle between a vector to the illumination source and a vector to the instrument. If not specified, the target is assumed to be at the center of the instrument field of view. If illumination is from behind the instrument, phase angle will be small. 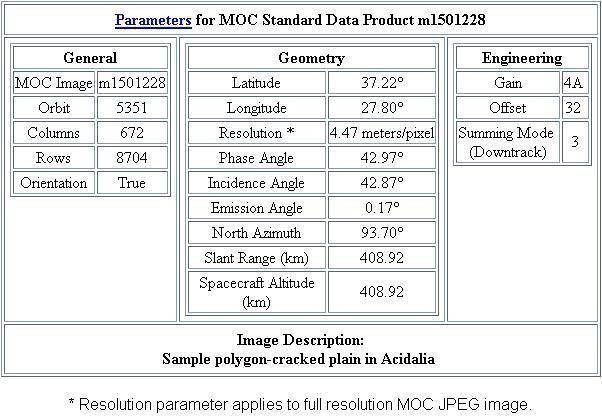 While all the pertinent data is important to interpretation of MGS images, we will are most interested in the parameters for Resolution, Incidence Angle, Emission Angle, Slant Range and Spacecraft Altitude. The incidence angle (42.87) is the angle of the sun from directly overhead. The complement (about 47 degrees) is the elevation angle above the horizon. The azimuth is 298.93, which means that the sun is about 29 degrees to the right of the top of the image. Basically, the image is illuminated from the upper right. This is helpful because it allows one to reasonably extrapolate or interpret the formation of shadows for a three dimensional construct this scope. Now let's look at Emission angle, Slant range and Spacecraft altitude as a single entity. The Emission angle is 0.17 degrees and is (I assume-correct me if I'm wrong here) a function of Slant angle and Spacecraft altitude. As the Slant angle and Spacecraft altitude are both listed as 408.92 Km the spacecraft was directly overhead at the time of imaging. (Another assumption-the small emission angle is the product of rounding errors or truncated decimal values of the aforementioned parameters-thus it's not equal to zero.) This virtually eliminates the possibility of pixel stretching or optical illusions incurred by imaging done at an oblique angles. Resolution and it's pertinence is discussed below in the physical dimensions section. Clearly, under the given imaging conditions, one can virtually eliminate the the possibility that this is a "trick of light and shadow" (TOLAS). In layman's terms, "What you see is what you get". Bear in mind that these numbers are not a direct corollary to actual dimensions as in a 2D image. There are components of height, width and breadth that cannot be easily delineated from one another without applying precise trigonometric functions to an accurate topographical survey. Still , they are indicative of the enormous mega-scale of this anomaly. The resolution for this image is 4.47 meters\pixel. By utilizing an imaging program, such as Photoshop, we can count the number of pixels in height and width of a particular feature and multiply that number by 4.47 to estimate the approximate size in meters of the feature being analyzed. At a scale of 4.47 meters\pixel a quick pixel count in Photoshop yields a height of approximately 74 pixels (top of Forehead) by a width of approximately 41 pixels (width of humanoid head). This translates to approximately 331m high by 183m wide (1085 feet by 600 feet). The overall distance from the "water" to the top of the head is approximately 1920 feet. The entire anomaly (humanoid and fish sculpture) is approximately 131 pixels high by 88 pixels wide or 585m by 393m(1920ft by 1289ft). That would make this edifice around three eighths of a mile high! A construct far larger than either Mt. Rushmore and Crazyhorse in South Dakota or Stone Mountain in Georgia. The roof of the "tunnel" entrance to the right of the opening is approximately 50 pixels (733feet) across at the leftmost arrow location. If this is indeed the "roof" of a structure the area enclosed is enormous. The ribs of the tube at the two locations shown in this crop are 38 (557 ft)and 32 (469 ft) pixels respectively (left to right) at the arrow locations. 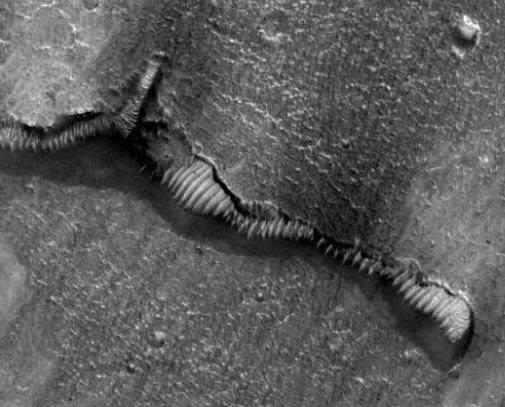 If, as postulated by JPL, these ribs are the crests of a Martian dune train, I would be curious to know what mechanism or geological process causes a sand dune to run 500 feet straight up a vertical cliff? And how, if composed of sand, are we able to peer above them into the darkness of the defile at the leftmost arrow and behind as well as between them at second and third arrows? It is beyond comprehension how anyone conducting an impartial investigation could come to the conclusion that this structure is a simple dune train! What possible reason could JPL and NASA have to dismiss such glaring anomalies out of hand with an inadequate explanation such as the one publicly given by a representative of JPL? This author, for one, cannot fathom the reasoning behind such a lack of scientific curiosity. After reviewing all the facts and data in regards to Mars anomalies I can come to no other conclusion than that these organizations for some reason do not examine the claims of Martian anomalies in a disciplined scientific manner when these unusual artifacts are presented by individuals outside of the Planetary science community. (It seems almost to be a threat response-fight or flight-when someone who is not a member of their exclusive club plays a trump card that they cannot counter). What possible impetus drives these organizations to dismiss out of hand or ignore the queries of the American taxpayer, who in effect, pays their salaries? It defies the very nature of noble ethics, good will and common sense that this nation was founded upon. The following images were sent by George Chittim from Vancouver who observed the same phenomenon here on Earth. 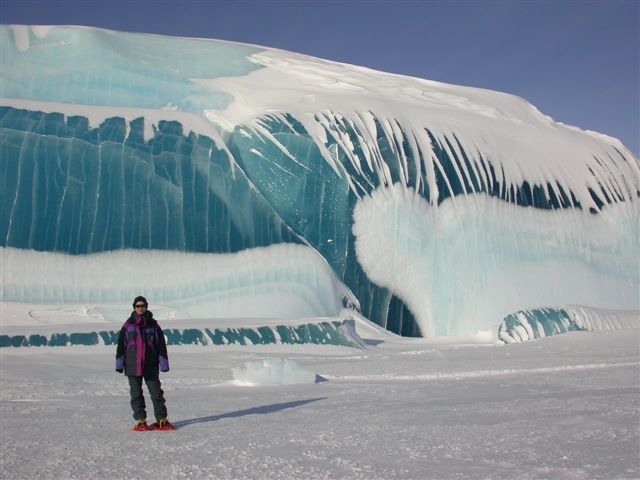 He states, "The tubes are actually ice. 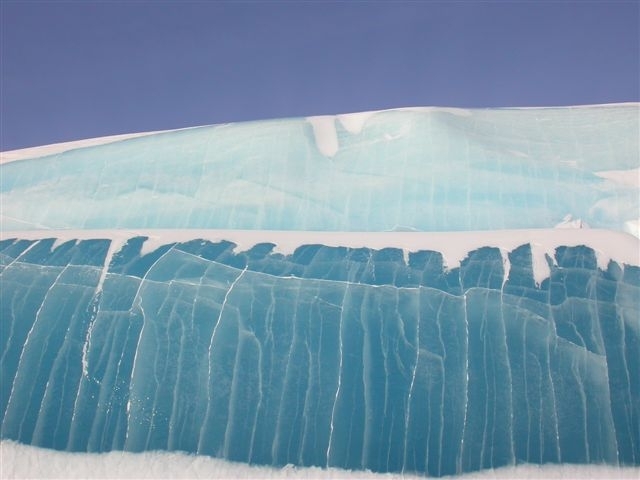 I suspect we are seeing the exposed edges of frozen oceans covered by sand. 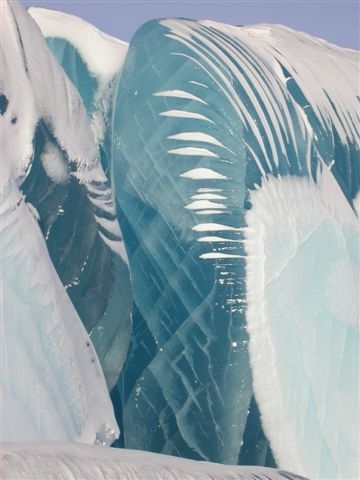 Here are some pics of ice on Earth with the same characteristics." They sure look the same... thanks George. NEXT--How big is this thing?